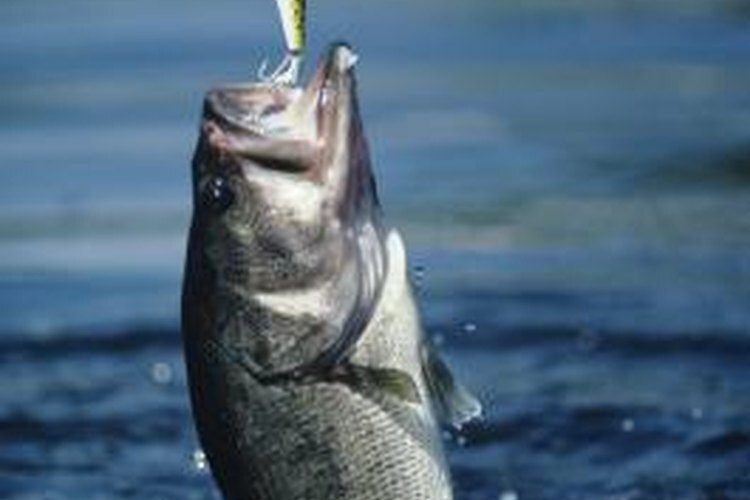 Largemouth bass are among the most sought-after game fish at Hammertown Lake. The crystal-clear waters of Hammertown Lake -- also known as Jackson City Reservoir -- harbor an abundance of game fish, making it one of the prime fishing spots in the Jackson area. This 157-acre man-made lake is stocked regularly by the Ohio Department of Natural Resources, and anglers are frequently rewarded for their efforts with catches of catfish, bass and panfish. Hammertown Lake is considered to be a two-story fishery, which means it harbors both warm-water and cool-water game fish. Warm-water species, including largemouth bass, bluegill and channel catfish, are the major draw for many anglers, but the lake is deep and cold enough to allow the trout stocked every spring to survive through the warm summer months. The DNR has also stocked Hammertown Lake with saugeye, a hybrid between walleye and the closely related sauger, which thrives in many deep reservoirs across the Buckeye State. Hammertown Lake has exceptionally clear water, steeply sloped sides and an abundance of rocky cover. Largemouth bass are available in fair numbers, but giants are rare, so try casting jigs, soft plastic lures and diving crankbaits around points, drop-offs, weed beds and rock piles. Bluegill are by far the most abundant fish in the lake, and all you usually need to catch them is a live worm on a hook. Trout fishing is at its best right after the season opens in early spring, and catfish often bite best in summer. Try smelly, natural baits like minnows and chicken livers for catfish. For saugeye, casting jigs tipped with brightly colored soft plastics around rocky areas in spring and fall. Boats on Hammertown Lake are restricted to electric motors and nonpowered craft only. The lake's small size, plus the absence of large motorboats, makes the reservoir ideal for canoes, kayaks and john boats. Launch facilities are available just off County Road 76 at the west end of the lake and on Circle Road near the east end. A public park and fishing area at the end of County Road 74 has a third boat launch site, along with ample open shoreline for bank fishing. The Ohio Department of Natural Resources has placed fish-attracting structure in the water at several points along the shoreline, and a map showing their locations is available through the DNR website. A current Ohio fishing license is required to fish Hammertown Lake for all anglers over the age of 16. Licenses are available at bait shops, sporting goods stores and a variety of other retailers across the state, including Callahan Hardware in Jackson and Lakeview Grocery and Sporting Goods in Oak Hill. You can also purchase a license online directly through the Ohio DNR. Statewide angling seasons, limits and other regulations are in effect. In addition to Hammertown Lake, several other bodies of water in the Jackson area provide fishing opportunities including Lake Alma, Jackson Lake and Buckeye Creek.